RandomGoodNews: Happy Easter - however you may celebrate! So most of us have been celebrating the resurrection of Christ this Easter by mainly hunting Easter eggs and gobbling them up. But in other countries Easter is celebrated in rather different ways. National Geographic has this year highlighted Slovakia’s tradition of whipping and drinking, Norway’s Easter crime fest and Jerusalem’s flam of Christ’s tomb. Enjoy! 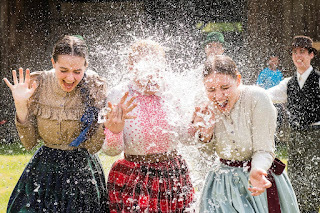 Historically, young women would entertain a procession of visiting male friends and family members who douse them with cold water and lightly whip them with decorated willow branches. Women, in turn, give their visitors eggs, food, and perhaps a drink of vodka. The custom is linked to Pagan type folk traditions welcoming the spring season and purifying the body and soul. It was also hoped that the young twigs would transfer vitality and fertility to the women. However, modern society has ended this unique tradition in some areas and greatly watered it down in others. Where women were once dunked in the river, they're now subjected to the use of a squirt gun or a perfume bottle, and whipping is often skipped altogether. The communist government's discouragement of religious rituals played a role in this, as did movement of rural peoples to cities where such provincial antics aren't in vogue. Norwegians devour Easter crime stories, or Påskekrim, like candy each year in the form of books, shows, and even cartoons adorning their favorite brands of milk cartons. According to Visit Norway, the nation's official travel guide, this unique secular tradition dates back to 1923 and sprang from the hopes of two young and broke authors who needed their crime novel to strike gold. On Palm Sunday of that year, the authors' publisher Gyldenal ran the book's title on the front page of the Aftenposten newspaper. Most readers thought the advertisement for the book, Bergen Train Looted In the Night was news, not fiction. The resulting sensation not only sold many books, but launched the tradition linking Norwegian Easter with crime—one that's been happily embraced and embellished by publishers ever since. On the day before Orthodox Easter, the faithful gather at Jerusalem's Church of the Holy Sepulchre on the site where many believe Jesus was crucified, entombed, and resurrected, to see an annual miracle they believe has occurred for more than 1,200 years. Orthodox church leaders annually perform a ceremony in which they receive a flame that is said to form at Christ's tomb, and bring it forth to light candles that spread the flame—and the faith—among the audience. The flame is then taken by special airplane to Russia, Greece, and other countries across the Orthodox world. Original story from National Geographic here.